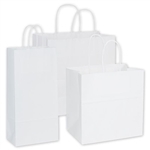 100 Bags per case containing 56 Cub Bags - 8 1/4 x 4 1/4 x 10 3/4", 30 Vogue Bags - 16 x 6 x 12 1/2", 14 Queen Bags - 16 x 6 x 19"
Mini Toucan Size, our smallest paper shopping bag. The ideal mini tote! White Kraft "Chimp" size. A perfect Gift tote bag! Size: 8" wide x 4-3/4" gusset x 10-1/2" high. 250 Bags/Case. The Jaguar is our most popular medium sized shopper. Shaped wide, it is the iconic paper shopper size. Also known as the "fashion". Made from durable White Kraft paper. 250 Bags/Case. White Kraft "Antelope" bags, also known as "Vanity". A great size in between Small & Medium, that's why we call it "Small-ish". Size: 10" wide x 5" gusset x 13" high. 250 Bags/Case. The Gazelle is our medium sized shopper shaped tall. Made sturdy White Kraft paper in the USA. 250 Bags/Case. This unique sized shopper was originally designed for shoe boxes. It's a funky medium wide shopper with a fatter gusset. Made in the USA from sturdy white kraft paper. 200 Bags/Case. The Zebra is our most popular large size. Made from strong White Kraft paper. 250 Bags/Case. It's not really "fat". It's a medium shopper shaped tall with a bit of extra space in the gusset. Durable White Kraft paper. 200 Bags/Case The Big Boy Gusset aka Lion is the ultimate "Take-Out" size. The unusually wide 9-1/2" side gusset allows product to be inserted flat without being turned on its side. That's why we call it the "Big Boy Gusset"
200 Bags/Case. We call this bag the Hippo and it is a jumbo size indeed, tall, wide with a fatter gusset! Made in the USA.